We supply expansion joints that are used to connect machinery to piping or to isolate one pipe from another across multiple industries. These include neoprene expansion joints for water-related applications and the use of nitrile (NBR, buna-n) or Viton® materials for fuels and oils applications, single and double arches, and rubber and solid steel flanges. We also offer a custom expansion joint pipe uniquely fabricated to absorb motion and displacement between pipe flanges or to accommodate pipe size reductions. 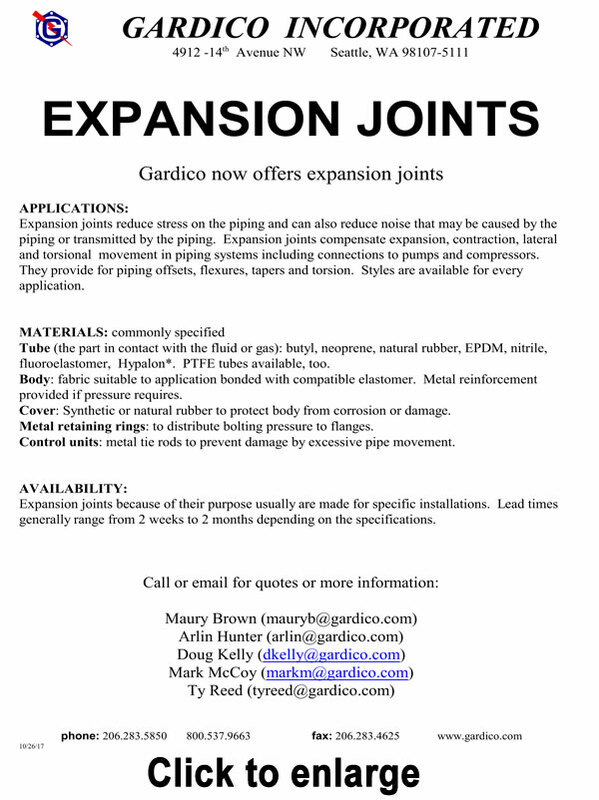 Call Gardico, Inc. to discuss cost-effective solutions for alleviating piping stress problems. We can create the right solution to remove pulsations generated by machinery such as water pumps with our neoprene expansion joint specifically designed to expand in an outward direction as each pulse passes through the joint. We also offer similar constructions specifically engineered for applications involving fuels and oils utilizing elastomers such as nitrile (NBR, buna-n), and Viton® materials. If you have a utility or process system in need of a custom expansion joint, we have the capabilities to fabricate it to meet your specific requirements. Call us. We have the resources and skills to find the right solution for your application. If we do not carry a standard product to meet your requirements we can fabricate the optimal expansion joint for your application.